The Jerk Chicken Festival is a funky fusion of Jamaican musical and culinary traditions with the rich culture of New Orleans Carnival! New Orleans and Jamaican culture are so intertwined that it's only fitting that we have a festival that beautifully blends the two together. 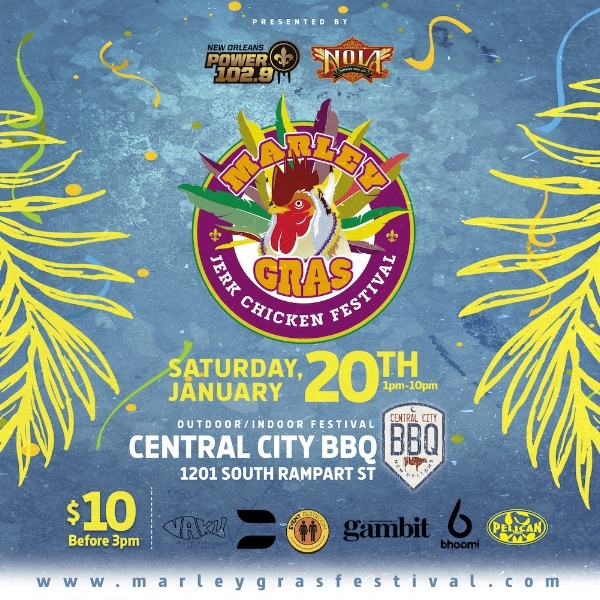 Marley Gras celebrates both in a way that only New Orleans can, seamlessly blending Reggae with Brass and Bounce, Jerk chicken wit Ya-ka-mein and gumbo, and handmade arts and crafts from New Orleans and Jamaica. Park with Premium and use promo code MARLEYGRAS for $2 parking at lots P251, P252, and P253.